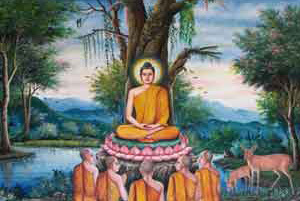 Asalha Bucha Day or also called Asalha Puja or Dhamma Day celebration is based on the lunar calendar and falls on the first full moon of the eighth lunar month. This day replaced Buddhist Lent as a holiday in 2007. People attend sermons at the temples and many will visit their ancestor's homes with offerings. Traditionally men will enter the monkhood on this day if their so inclined. Historically about 2500 years ago is when Buddha's first sermon in Deer Park in Benares, India took place with the founding of Buddhist sangha. The sermon calendar is called the "Setting the Wheel of Dhamma in Motion" Buddha stated the Four Noble truths and the Noble Eightfold Path.